The meandering waterways of the La Crosse area are an absolute paradise for paddlers of every stripe. 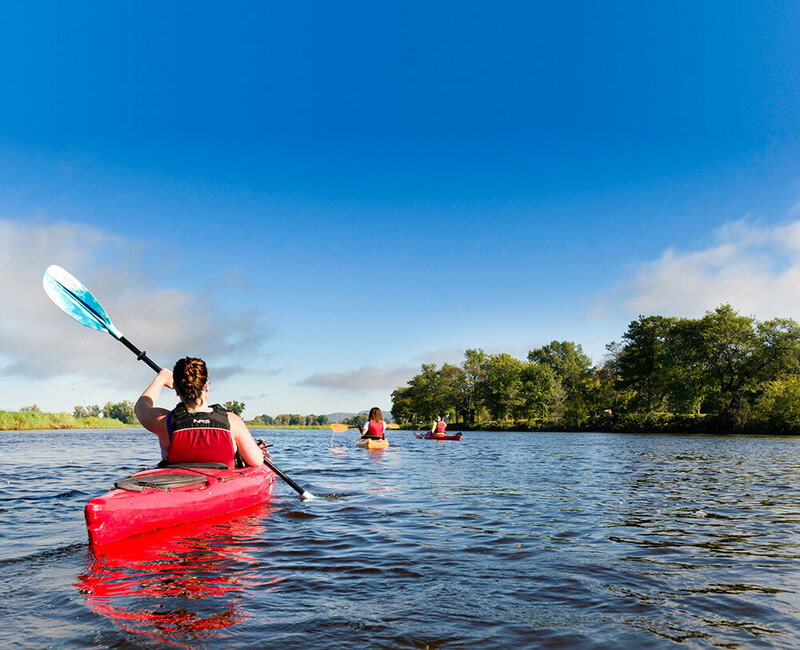 Take the family on a gentle canoe ride through relaxing wetland courses, or enjoy moderate to strenuous kayaking adventures along the Mississippi, Black, or La Crosse Rivers. Canoe trails, launches, and outfitters abound in the area, making it one of the best paddling destinations in the region. Check out this excellent map of canoe launches in the area to find the most convenient access point for you! One of Western Wisconsin’s most popular campground destinations located in West Salem, WI, just 14 miles from La Crosse, Neshonoc Lakeside Campground Resort offers canoe and kayak rentals for paddlers who wish to explore and relax on Lake Neshonoc’s beautiful, placid waters. This 115-site campground is located directly across the Mississippi River’s main channel from downtown La Crosse, offering excellent access to the myriad backwaters and smaller channels meandering through the area, as well as canoe and paddle boat rentals to explore them. Five miles of easy paddling. The trail is through the Mississippi backwaters and can take 3 to 4 hours to complete. Directions from La Crosse: Take HWY 35 N to Trempealeau, head south on Fremont Street (Lake Road), pass the railroad tracks – 1.5 miles to Long Lake Landing. The newest marked trail on the refuge. Follow Mississippi River backwaters out into Lake Onalaska. This is a canoe area without a marked trail. The area is closed year-round to motorized watercraft and is easy paddling. Directions from La Crosse: Take HWY 35 N, turn left on Cnty Rd OT, turn left onto Cnty Rd ZN, turn right onto Cnty Rd Z. Follow Z to the end of the road. NOTICE: Lake Onalaska Voluntary Waterfowl Avoidance Area is in effect October 15 through mid-November. When large numbers of diving ducks are present on the lake buoys mark the boundaries of the area. The La Crosse River is an often overlooked paddle through the Onalaska area to Riverside Park in La Crosse. With 6 conveniently spaced boat landings situated below Lake Neshonoc. For a leisurely paddle to Riverside Park, put in at Holiday Heights and meander past the bluffs and through the marshland. The Onalaska Waterfront and Spillway offers an opportunity to go canoeing & kayaking in Mississippi backwaters. Turn west on Irvin Street off of Highway 35, one block south of Onalaska’s Main Street. The City of Onalaska Park and Rec department has a few canoes and kayaks available for rent down at the waterfront. Stop into City Hall at 415 Main Street or call 781-9560. Canoe and Kayak rentals on the La Crosse River. Choose from 2 and 4 hour trips, only 20 minutes out of La Crosse. Canoe and Kayak rentals on Lake Onalaska. They also have pontoons and fishing boats to get you out on the water. On the Black River, Island Outdoors offers canoe and kayak rentals along with water bikes, SUP boards, and peddle boats. Check out their evening guided paddles. Sid’s Bay Boat Rentals on Lake Neshonoc offers Pontoons, Fishing Boats, Kayaks and Stand Up Paddle Boards for rent. Off Highway 16.